Extract all the CDs and PCMCIA card. Check that the radio is not connected to the phone via a Bluetooth connection. Insert the DVD-1 into slot 1 of the CD changer. Wait for the initial boot and confirm the launch of the update by clicking the "Ok"
Stock up with a charger for the phone, or drive around the city ... Find what to do yourself - the upgrade process takes more than 2 hours! But you can turn off and turn on the car during the boot process, and it will continue from the point of stop. It is not recommended to use the recorder during the upgrade process. Copying Disk 1 will end with 97% of the overall readiness. When the screen prompts you to change the disc - remove disc 1 and insert disc 2 into the same slot 1 of the changer. If drive 2 does not start in slot 1, insert disk 2 into slot 2. This can happen on old software, mainly in the 2008 C-class. If your computer has old software installed, the upgrade disk will be displayed as version 2016, but in fact it is V17 2017. The current version of the installed software can be checked in the Commander menu. The "hang up" button + # + 1 then select option 3, then 5 on the pop-up screen - should show Release 16Q1. 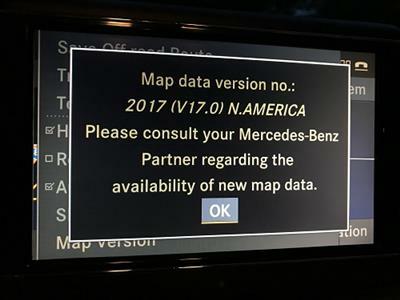 This Mercedes-Benz map update offers a combination of new and modified data that improves the accuracy of your NTG4 COMAND® navigation system's routing and estimated travel times. Every year, an average of 40,000 turns restrictions, 30,000 one-way streets, and 18,000 road signs are in the United States and Canada alone. This package contains two DVDs along with information on how to install this map in your Mercedes-Benz Navigation System.